A frustrating 10-9, 11-inning loss to the Oakland Athletics grew even more painful for the Angels Tuesday night when they lost Kole Calhoun to a right ankle sprain, an injury that will send their starting right fielder and leadoff hitter to the disabled list on Wednesday. Calhoun was just starting to heat up at the plate with three consecutive multi-hit games, raising his average from .178 to .250. Tuesday night, he singled and scored in the first inning, hit a two-run homer to right field in the fourth and doubled ahead of Mike Trout’s score-tying, two-run homer in the bottom of the ninth. But after hitting a routine grounder to second to lead off the 11th inning, Calhoun twisted his right ankle in a divot beyond the first-base bag and had to be carried off the field. 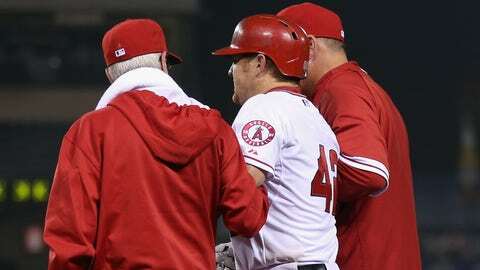 He was on crutches after the game, and Manager Mike Scioscia said Calhoun is "definitely" going to be put on the DL. "I don’t know what happened, man, it wasn’t anything that special," Calhoun said. "I didn’t see a replay or anything. I just rolled it, and it hurt real bad. It’s just a freak thing, you know?" Another outfielder — either Brennan Boesch or Matt Long — is expected to be called up from triple-A Salt Lake, but the Angels could also pursue speedy and versatile outfielder Sam Fuld, who was designated for assignment by the A’s last weekend and can play right field and bat leadoff.